The average diabetic person takes around 3,000 steps per day and walks about 1,000 miles every year. That’s a lot of wear and tear on our feet! It’s important that we wear the right kind of shoes. For diabetics its even more important because lack of sensation, or neuropathy can develop and lead to greater problems like infections. Remember, just because you can’t feel anything doesn’t mean that there isn’t a problem. Having shoes that protect your feet is a necessity. Proper foot care is an important part of an overall treatment program for people with diabetes, even for those in the earliest stages. If there is any evidence of neuropathy wearing the right shoes is crucial. At ABLE our full time Pedorthotists can walk you through simple and easy foot care programs. We also offer a variety of styles and brands for diabetic shoes such as Dr. Comfort and iRunner. We want you to have what you need for quality foot care all day every day. 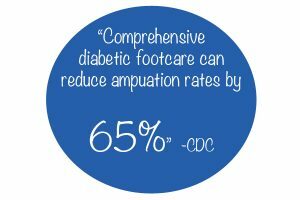 For more information on Diabetic foot care click here.